I’m sure you’re familiar with the good old sparring exercise, “king of the ring” where the winner stays on and the loser is replaced by another student. Take a look at this quick diagram below. 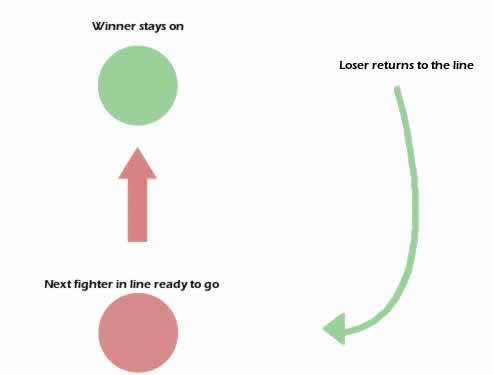 The green circle represents the pair fighting and the red circle represents the line of students waiting for their turn. This is a good karate kumite drill when you have a small group of 3 to 6 students, however when you have a group of 10 or more then it could be a while before the people waiting get their turn. To make matters worse your best fighter might stay on for the duration of the drill, and the ones who need practice spend little time on the floor. For a big group, have multiple fights at the same time. Winners stay on as before, losers return to the line. Next in line takes the next available fight. This is cool because students are constantly rotating, fighting different people all the time. You can set this up multiple ways. I like to have quick rotations, so I like the rule that the first to score a clean hit is the winner (sloppy technique is not awarded a point). Also the flip side of “first to score a clean hit” helps students work on one of the most basic concepts of karate – not getting hit. You’ll find that your fighters will be more careful because they’ll want to stay on. 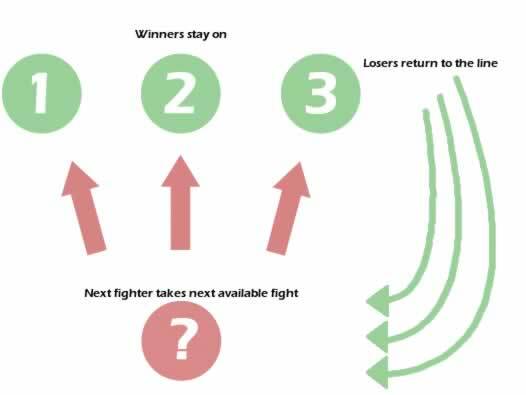 However, if you would prefer to steer away from the “point fighting” method, you could impose the rule of “first to score a clean combo”, or “first to dominate the other fighter”. In fact you could get really creative and set a rule of “first to score with (insert your chosen technique here) is the winner”, or limit the “King” to certain techniques, etc. But when starting out, keep it simple until your students are ready for the more complex variations. TIP: You’ll have difficulty setting times for each fight and trying to determine a winner with multiple groups. The more you can have your fighters self-regulate their match, the better. Anyway, there are a bunch more ways to run this exercise and I’m sure you’ll put your own spin on it. If you have some ideas you’d like to share, I’d love to hear them. So please add your comment (yes, the Captcha is now working), and share this post. What’s your “go to” technique? You know the one – your favorite technique that you can’t live fight without? And what about your students? I’m sure their choices are as vast and varied as the colors of the rainbow. Now what if you couldn’t use that technique anymore. Last week one of my instructors and I were talking about this exact point and came up with the following idea for a sparring exercise. Have your students pair up ready for sparring and have each of them tell the class their favorite technique. After every student has proudly announced their choice, you the instructor explain that they’re going to fight but they are not allowed to use THAT technique. You’ll have some students that can’t kick with their front leg, others who aren’t allowed to throw a reverse punch and some who aren’t allowed to sweep. With each new round make sure each student informs their opponent of their banned technique. This exercise forces students to avoid their “go to” technique and work on other things, which of course helps them improve their sparring ability. It sounds simple I know – and it is. But it’s also a useful martial arts exercise. P.S. I finally fixed the Captcha form below so you can leave comments again. There was an improperly installed plugin that was creating havoc, but now it’s all good. Take ten karate students and have them perform their kata individually and you might like what you see. Take the same ten students and have them perform the kata together, and you’ll notice variations. You’ll see differences in timing and speed, which is fine unless they’re performing team kata for tournament. However, you shouldn’t see 10 different variations in technique. Last night I brought this point to my students’ attention, after a botched attempt at Annanko. To be fair, for some it was their first time learning that kata. However I had two or three who were doing some moves differently to the group. I asked those students if they could do the moves again but this time from their most basic stance, yoi dachi. They went ahead and did the moves correctly, which were DIFFERENT to what the had just performed in the kata! When I asked why there was a difference, puzzled looks washed across their faces. “I thought it was a different move”, said one of the boys. From their expressions I could tell they hadn’t yet made the connection between kata and kihon. I told my students if they ever were unsure about a move in a kata, or a way for them to evaluate themselves, was for them to go to the very basic form of that move, and figure out how they do it. From there they need to carry that notion into their kata practice. 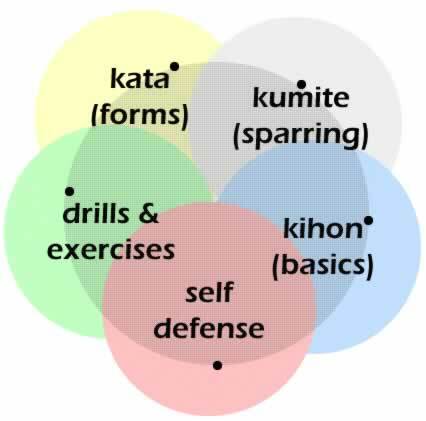 That means the basic block/punch/kick/strike/whatever shouldn’t change between the basic form and the kata form. If your students show variations between basic and kata then perhaps you might like to rework your training methods. As instructors we must teach in a way that keeps techniques consistent between all aspects of karate – basics, kata, bunkai, self defense and even kumite. 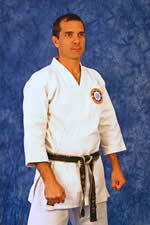 In other words what you practice in kata and bunkai, should be present in kihon and other self defense application. For example, let’s consider a beginner’s class where they might be learning Tai Kyoku Shodan – a simple “I” shape kata common to many karate styles. Taking that kata as the focus or foundation of what the class is learning, then the basics you teach should reflect techniques from that kata – namely, oizuki and gedan barai. Furthermore any drills or exercises you teach in that class should also incorporate those techniques. Extend that concept to self defense and what you teach in that class should also incorporate those techniques. Everything should overlap and reinforce. This is a far more congruent way to teach and helps students join the dots faster between the different aspects of karate.